You Are Not Getting Paid!! This comprehensive, stand-alone publication is direct from an August 2015 seminar that covered key topics in employment law. The plaintiff has been awarded damages. Now what? Explore the many steps between being awarded monetary damages and actually receiving the money. Understand the intricacies of liens and other claims on the award. Learn what to do when the defendant doesn’t pay the award. Government Attorney? 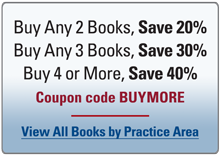 Receive a 30% discount on publications, and a 50% discount on most seminars. New Virginia Lawyer? (less than three years) Receive a 25% discount on publications and most seminars. III. You Are Getting Paid!!! IV. You Are Not Getting Paid! !